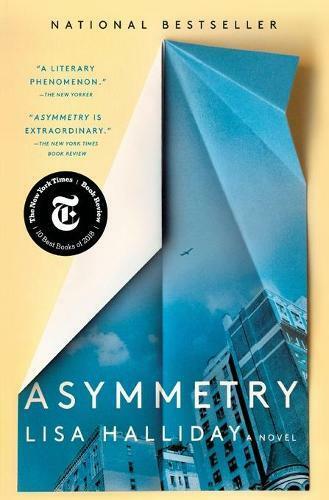 The bestselling and critically acclaimed debut novel by Lisa Halliday, Asymmetry, hailed as extraordinary by The New York Times, a brilliant and complex examination of power dynamics in love and war by The Wall Street Journal, and a literary phenomenon by The New Yorker. Told in three distinct and uniquely compelling sections, Asymmetry explores the imbalances that spark and sustain many of our most dramatic human relations: inequities in age, power, talent, wealth, fame, geography, and justice. The first section, Folly, tells the story of Alice, a young American editor, and her relationship with the famous and much older writer Ezra Blazer. A tender and exquisite account of an unexpected romance that takes place in New York during the early years of the Iraq War, Folly also suggests an aspiring novelist’s coming-of-age. By contrast, Madness is narrated by Amar, an Iraqi-American man who, on his way to visit his brother in Kurdistan, is detained by immigration officers and spends the last weekend of 2008 in a holding room in Heathrow. These two seemingly disparate stories gain resonance as their perspectives interact and overlap, with yet new implications for their relationship revealed in an unexpected coda. A stunning debut from a rising literary star, Asymmetry is a transgressive roman a clef, a novel of ideas, and a politically engaged work of metafiction (The New York Times Book Review), and a masterpiece in the original sense of the word (The Atlantic). Lisa Halliday’s novel will captivate any reader with while also posing arresting questions about the very nature of fiction itself.